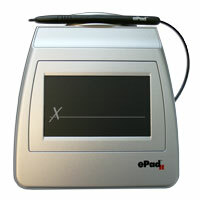 ePad II™ is ePadLink’s upgraded electronic signature capture device for high-performance applications. IntegriSign® eSignature software offers plug-ins for Microsoft Word, Excel, Outlook as well as Adobe Acrobat, so you can start esigning out of the box. Powerful SDKs can be used to implement an esignature solution in any third-party software platform or build your own custom application. Please click below for datasheet.